It’s been two years since our first, last and only West German pottery sale. That was when we were living in our old house, a wonderful two-up-two-down terrace where the pots overfilled the downstairs like the Magic Porridge Pot… Now, we live in a slightly larger abode with a double garage and we’ve decided it’s time for another one. Sale, I mean. 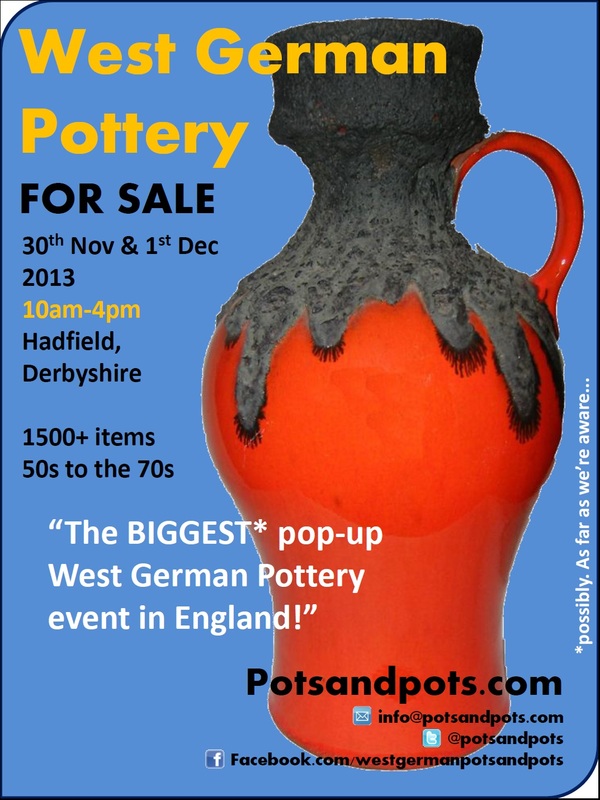 Facebook: www.facebook.com/westgermanpotsandpots <—- There’s an ‘event’ you can join here. If you do think you can come, please let us know. It just means I’ve got a vague idea how many crisps I need to put out. We’ll be putting on ‘a bit of a do’ on the day. Well, some nibbles and some wine (wine is OK at 10am, isn’t it? )… and there’s no obligation to buy, whatsoever, If you just fancy coming for a bit of a chat and to meet some other WGP officianados (is that a word? ), then come along! Next Post Our West German Pottery Sale!